A Bartenders Dilemma: What do we do with all the Crown Royal Bags? 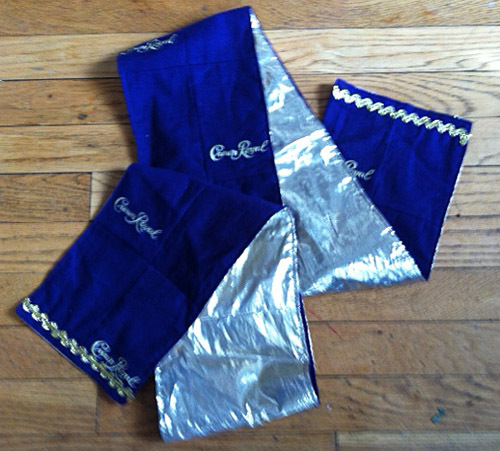 A Bartenders Dilemma: What to do with the Crown Royal Bags? 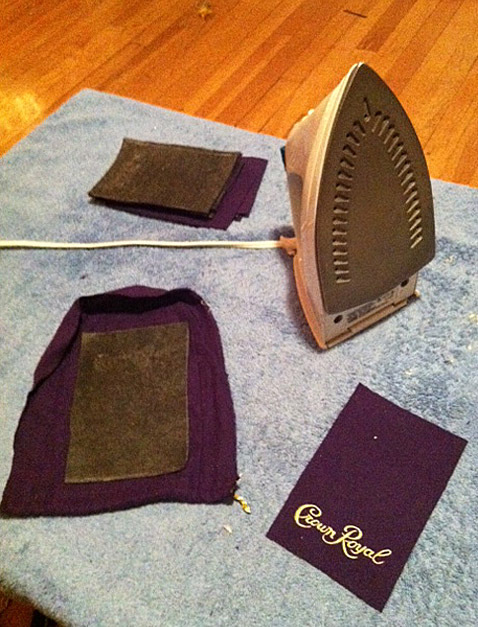 Thanks Lilly for letting me do a guest post my Crown Royal bag, sewing extravaganza. I’m a bartender at the Streamline Tavern and I have a hard time throwing away the bags that the Crown Royal whisky comes in. My customers are maxed out; they don’t want them any more,.. but the bags are too nice to throw away. We joked about making a quilt out of them, then someone with a smart phone actually did a web search on Crown Royal quilts. Lo and Behold, there are dozens of Crown Royal quilts out there! This tweaked my competitive, crafting muscle and got me thinking. What about taking it a step further? Make a quilt out of the bags, make clothes out of the quilts, then gloat about the clothes on Lilly’s sewing blog! Step 1: (the easy part) Collecting enough bags for the project. So, it turns out I am not the only one out there hording these bags. Almost every bartender does, and they’re happy to off load them on an eager crafter. My friend Opie, a bartender at Dante’s stole the show by bringing me 200+ bags from his bar. Here’s the scarf I made him as a thank you. I regretted not prewashing the bags when my pants shrunk 1 ½ inches on their first wash… And I didn’t even put them in the dryer. Fortunately, I did remember to soak them in a white vinegar and water solution to secure the dye before washing them the first time. Two things I noticed right away: The fabric, a lightweight flannel, is flimsy. Also, it is difficult to cut the uniform squares necessary for a smooth quilt out of the little bags. Iron-on interfacing was the solution to both woes. 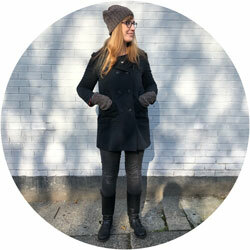 I like my clothes to be constructed out of firmer fabric as it tends to disguise the areas where I am not so firm. I’ll use the flattering term, “curves” here. Stiffer fabric tends to smooth things out a bit. I used a ruler and a fabric marker to make a grid of 4” by 6” squares on a sheet of interfacing. Then I cut the bags in half and ironed on the interfacing squares, trimming off the excess fabric on the edges. I later discovered that the sleeves and the flouncy cowl neck of the dress I was making needed to be made out thinner material so the fabric would relaxed more. I went back and remade these pieces without the interfacing and it worked perfectly. Step 4: make your quilt. 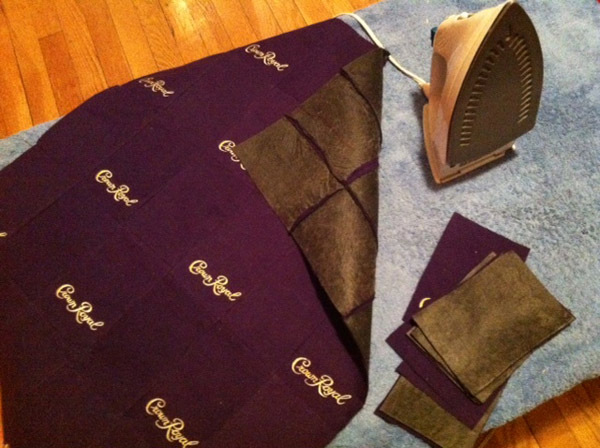 I staggered the squares with the Crown Royal logo on it with the blank squares from the back side of the bag sewing them top to bottom into long strips. I sewed the strips together, side to side, to make a basic quilt. I measured carefully against the patterns so I didn’t waste bags, cutting and pasting with strips from the middle of the bags to fill the corners. I found this to be the hardest part, bordering on tedious. 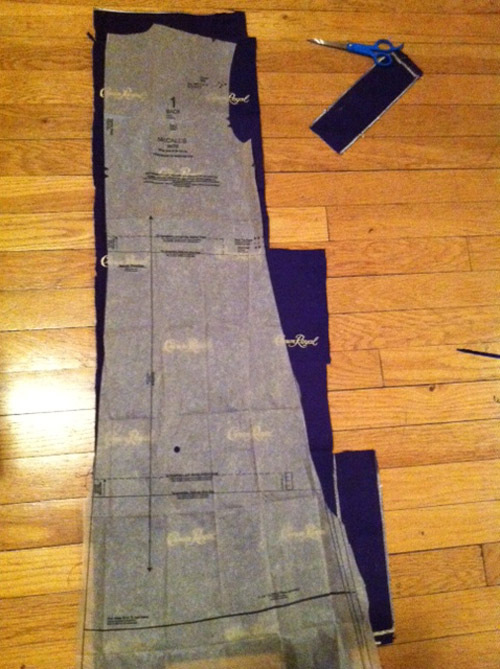 Step 5: Cut out your Pattern & sew your creation. I’ve left out some of the How-to details in this section because any basic dress or pant pattern will work. As I tend to improvise, I don’t actually have a pattern to recommend. 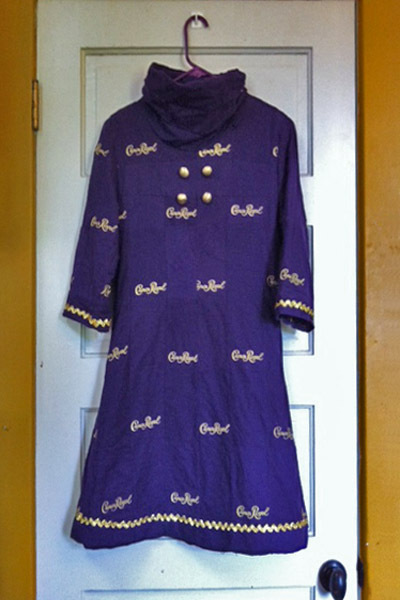 I can, however, explain why I chose the styles I did for my Crown Royal garments. I chose to make a pair of sailor pants so I could use gold buttons and because I think the flared leg helps reduce the pajama look that haunts all flannel pants. I used an old pair of sailor pants as a pattern, drastically simplifying the pattern by removing the top, waistband. Reducing the number of buttons from 13 to 6. I chose to make a ‘60s style go-go dress because I wanted a flashy dress style with a hint of circus — like something a trick-riding gal standing on the back of a horse would want to wear. The pattern needed to be a simple enough that the details of the dress wouldn’t compete with the busy fabric. 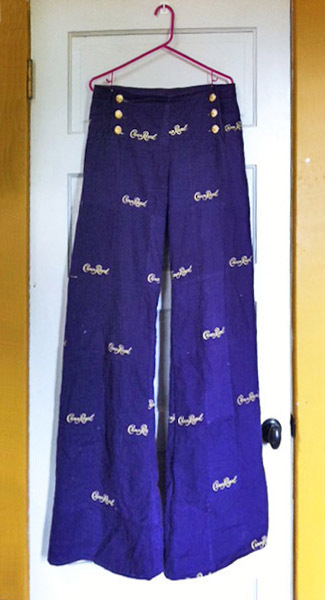 What Crown Royal garments still need to be made? 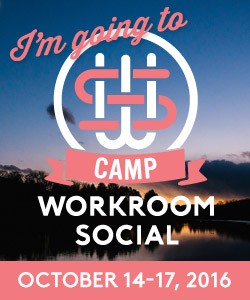 Maybe an evening gown with some smart, gold piping or a cape…something with a fringe perhaps? Bedazzle with anything and everything gold, compliment it with green if you want a perfect Mardi Gras outfit. I used gold buttons in as many places as possible and a sew-on, gold, zig-zag boarder. 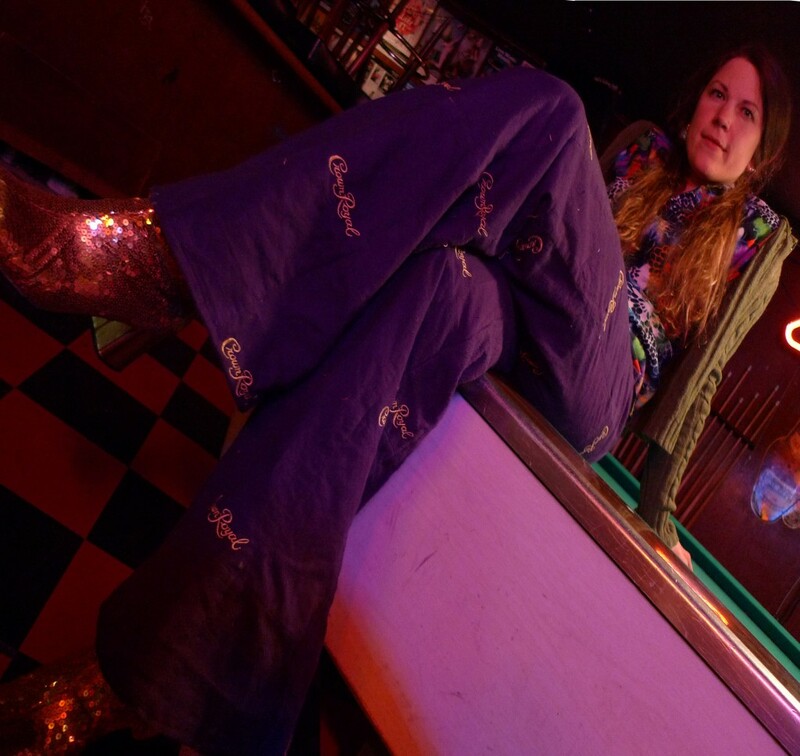 My boyfriend found an amazing pair of gold, sequin go-go boots on the internet, that proved so dazzling that I considered renaming this blog, “Make an Outfit to Wear with Gold, Sequin, Go-Go Boots”. 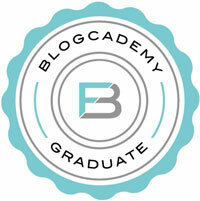 Thanks for reading my guest post! I witnessed this dress in person people and let me tell you, it is stunning! And I have to say….Step 6, should always be Bedazzle, everything is better when it sparkles!!! wow Mary, your creations are magnificent! I admire your ability to finish up a potentially time consuming project like that. I have several unfinished ones, myself. Very cool. That is freakin awesome! Crown Royal should have some kind of contest for using their bags. How much vinegar to water & how long to soak? Please & thanks. You’ve given me quite a few ideas. Make a bikini..they are super cute. Car seat cover and steering wheel cover. Thank you! this is exactly the kind of tips I have been looking for. I’m looking to make a quilt for my husband,how many bags do I need? I cook at a small Italian Trattoria which features a bar that specializes only in wines, high end liquors, and craft beers. At the end of the night, if they have any Crown Royal bags, someone from the bar will come back to the kitchen to ask the cooks, dishwashers and bussers if they want one. I like the creative ideas here better though!